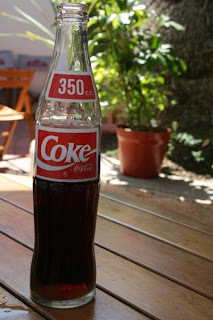 My Life in Chile: Coca Cola in glass bottles! I probably sound like I am having serious culture shock here by some of the things I say. The truth is… I haven’t really experienced culture shock at all. * Chilean culture is different but I haven’t felt that anything is extreme or shocking to my brain. It’s more about the way they do things here are sometimes different and amusing. Even some of the littlest things are so exciting to me, such as Coca Cola in glass bottles! I remember getting excited back home when we found Coca Cola in the 6-pack glass bottles one time and here, Chileans receive their Cokes in glass bottles everyday! And what else that is so great, the glass bottles are RECYCLED! Yes, they re-use them. It’s always a good idea to pour your Coke into a cup instead of drinking from the glass bottle for this reason. *The Meat Man: Ok well, there was one moment when we first arrived to Valparaíso. During the first week when we were being herded through the city as a giant group of American students, I witnessed a grotesque sight of a man carrying an entire bloody, cow carcass through the street on his back to La Carcinería (place to buy fresh meat). You could tell the cow had just been slaughtered and the meat was pretty fresh. As he came around the corner with the giant carcass on his back (I can’t even imagine how heavy it was), everyone cleared out of his way and I had to quickly turn away before throwing up. The smell, and of course the sight, was awful.